This weekend my Xbox 360 blinked out a red and circular death. I bought my Xbox early in 2006 and I considered everyday with it a gift. But, like a delicate flower, I realized that it wasn't long for this world. So I tossed it in the trash and hooked up my Wii. If I couldn't experience amazing graphics I was going to take it in the opposite direction; that Saturday evening I was going to become a retro gamer. Retro gaming is a phenomenon started by gamers who want to talk about the good old days, despite the oldest confirmed retro gamer being just under the age of 40. It's a curious hobby that seems to be confined almost exclusively to Japanese consoles and Lucas Arts adventure games. Entire magazines have popped up around the hobby, and it's not uncommon to encounter a podcast with a twenty something waxing poetic about how the last great Final Fantasy game was FFVI. In fact the whole scene isn't so far removed from the world of wine tasting. Retro gamers will often talk about a game in similar terms. I once heard Master Blaster described as a transcendent blend of platformer and shooter with hints of Zelda-esque adventure rising to the surface. It all seemed very obscure and cool, and I figured that by the end of the night I would have some really crazy references to throw into my gamer conversation. I envisioned saying something like "You can't really understand the origin of the sniper rifle in games until you've played Golgo 13." So I went ahead and downloaded a few obscure looking titles. The first title I played, Lords of Thunder, only came out on the TurboDuo. True retro gamers are all extremely well versed in their TurboGrafx, err I mean PC Engine games. The PC Engine never saw much support in the US and had enough add-ons to make even Sega blink twice. All of which is to say that a huge import library and really obscure hardware equals retro gaming gold. So I fired up Lords of Thunder, which I soon realized was like a retro game before the concept even existed. Lords of Thunder is noted by aficionados for having a distinct blend of hair metal and shoot 'em up with an aftertaste of 70's conversion van. This was totally awesome in 1988. Unfortunately the game came out in 1993, well after we'd realized that Nirvana was a little more inspiring than Motley Crue singing about kick-starting hearts. However, taken out of that context, I found that the game was now ironic, and I laughed with derision at the developer's totally cheesy attempt at a game. Alright, that previous sentence is a lie - I thought Lords of Thunder was unabashedly awesome. Five minutes after I started playing I was overwhelmed with the urge to put up a Frank Frazetta Conan poster in my room. I was actually headbanging while I played this game, an act that, while difficult to execute in a shooter, is totally necessary to enjoy this game. After playing it for an hour or so I moved on, but I realized I hadn't gleaned any intelligent references from it. It was just a shooter and I doubted hair metal would be a popular choice for game soundtracks anytime soon. It was a lot of fun but where was the profundity? I played a couple of other PC Engine games to round out the experience, none of them notable except for the one that starred a hydrocephalic. My Saturday night was only half over though. My right thumb thoroughly exhausted from tapping the fire button over and over, I decided to try out World Heroes, an old Neo Geo game. I was pretty excited because the Neo Geo was a system almost no one owned, which naturally sends its insider status through the roof. It is the rarest of vintages. However I quickly learned that the Neo Geo has, it turns out, only three games: Metal Slug, Magician Lord and a fighter called Artofworldfatalsamuraishowdowns Perfect Edition. Lack of genre diversity aside, it was in playing World Heroes that I realized I couldn't go home again. World Heroes is a curious game that would no doubt be described by Neo Geo cognoscenti as abrasive in its imitation and light in its complexity. In regular speak that means it's a Street Fighter II rip-off. In fact, all the fighting games I played that had made their way from the Neo Geo onto Virtual Console were more or less SF II rip-offs. Some had a little more character than others, I was particularly taken with the proclamations of Samurai Showdown's Kabuki character, but most were carbon copies of the thumb skinning blue print established by SFII. There was very little I could learn from these games except that they belonged to a very specific moment in gaming history; a moment not always worth revisiting. At four in the morning, my controller's d-pad caked with skin and my thumbs raw, I brought my experiment with retro gaming to a close. I had no interesting retro game references and I didn't care if I saw another sprite filled game for the rest of my life. And then I remembered in the back of my closet was a PlayStation 2. Too old to be current and too new to be retro, there it sat unloved and alone. So I hooked it up and as I started playing through Rygar: The Battle of Argus, I noticed how similar it was in some ways to God of War. It struck me that it could be considered a predecessor to that game. It was older but still very relevant. And that's how I ended my night, sifting through videogaming's very recent past, and finding it far more illuminating, not to mention entertaining, than any retro game I had played that night. 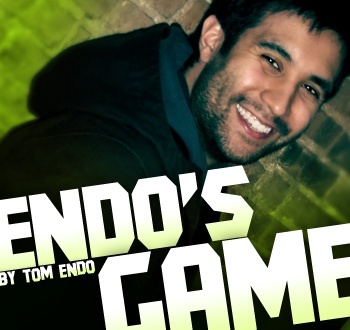 Tom Endo is eternally thankful his parents never bought him a Neo Geo.